There are some things that I had just never expected to hear in my life. Open-world pinball adventure is one such thing, and yet E3 2017 brought me not only the theory but the execution of the idea as well. 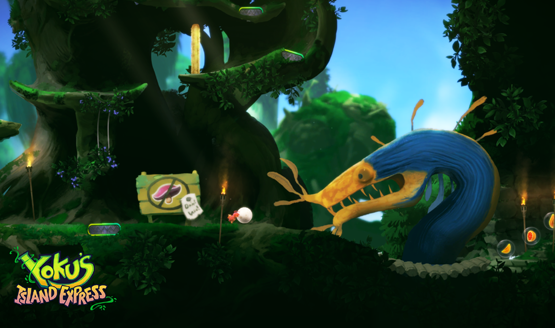 This is the premise behind Yoku’s Island Express, a game that combines Metroidvania-style exploration with… you guessed it, pinball. Yoku is a dung beetle (the most adorable of little dung beetles) that rolls a ball around the island to collect fruit, defeat bosses, and ultimately take his place as the island’s postman. The art style is inspired by Studio Ghibli films and the wonder that they inspire. This feeling was immediately apparent as I rolled forward, eager to explore the beautiful island and see what secrets it had to offer. The first moment that I arrived at a flipper, controlled by either the R1 or L1 buttons, depending on the color, was a delight, realizing that my navigation through the world would come through the traditional game of pinball. The developers have created the world so that there’s no real loss in the same way that pinball can cause crushing defeats by losing a ball right between the flippers. The island is made to promote exploration, so secret areas may be a little more reliant on skill shots, but losing your ball between the flippers isn’t the end of the game. Often this just leads to a new area to explore. 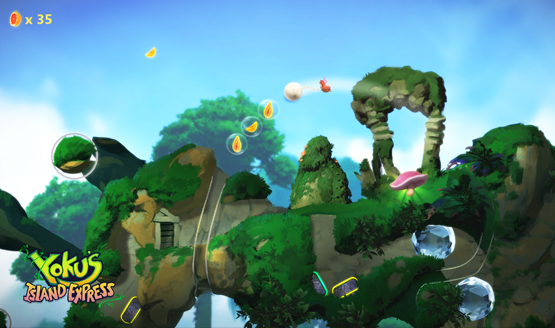 Combining the two mechanics of pinball and being able to have direct control over Yoku rolling the ball around makes for a dynamic game that embraces the joy of pinball while instilling a sense of wonder and discovery. The part of the island I was able to see was the traditional bright sunshine filled green island aesthetic, but there are additional environments as you move deeper into the island. From the trailer, it appears that there will be at least snow and desert areas, with more likely hidden away. There’s also a varied cast of character that will present Yoku with quests and objectives as he moves through the pinball-inspired world, providing goals and places to go. The map is huge and the developer is expecting a normal playthrough to approach the five hour mark, although this early in development that target time could very likely change before it releases, not to mention all the secrets and trying to make difficult shots to reach hidden areas. I play a lot of games at E3 every year and there’s a select few that I desperately want to continue playing when the demo wraps up. When the title screen for Yoku’s Island Express popped up, I desperately wanted to reenter that world. It was my last game demo of E3 this year and left a lasting impression as I made my way out of the doors and back to the hotel lobby. Yoku’s Island Express is a rare game that combines an adorable and endearing charm with engaging and unique gameplay mechanics. Yoku’s Island Express releases in 2018 for PS4, Switch, Xbox One, and PC. Check out all of our E3 coverage.